Performing a hula showcase for the guests of your luau would make you one Hoihoi Hostess (Hoihoi being “entertaining” in Hawaiian). And even if you just bumble through it like the guy in the green shirt and revert to the robot dance, people appreciate your enthusiasm. Similar to my baking – it’s the thought that counts. If anyone actually does this at their Luau – you HAVE to tell me. But, if you are not willing to shake your money maker for a crowd, I have another idea for entertaining. It is no surprise that I am a fan of the board game. I do enjoy a game of Pictionary, Trivial Pursuit or Balderdash. That’s right Balderdash – that hilarious game of bluffing. If you have never played (I feel sorry for you), you can get the full scoop at Wikipedia. But, the basic gist is that everyone has to make up a definition of the same word and you guess which the correct definition is. Doesn’t that sound like fun? Are you stumped? Well, get ready to hold you sides…(I put the answer in the comments)… Oh, my eyes are watering from the laughter! If you feel your guests are not amused by Hawaiian Balderdash, I say the hukilua is a strong backup or a robot dance. Right On! I’ve got to Boogie. I’m not really going to bother talking about decorations. I don’t think a party store can call itself a “Party Store” if it doesn’t have a Hawaiian Luau aisle, Mardi Gras section or 50’s Dance Party display. So, you know what to do. This will determine the success or failure of your Luau — in fact, the Hawaiian translation of Luau is feast. So, you’ve got to get your food on. What incredible pomaika’i (luck) that this grown-up request comes on the heels of a fabulous menu created by the brainchild of bacon, the clever cake-in-the-mug-maker, boozy-paint-can-shaker: Bacon Concentrate. The “Celebrate Someone Special with a Hawaiian Luau Dinner” more than fulfills the feast requirement. I haven’t really talked about music before – it’s not one of my strengths. I am hoping DJ Running Man in the sister offices in Eastern PA will help me with a music post. He knows how to rock an ipod. 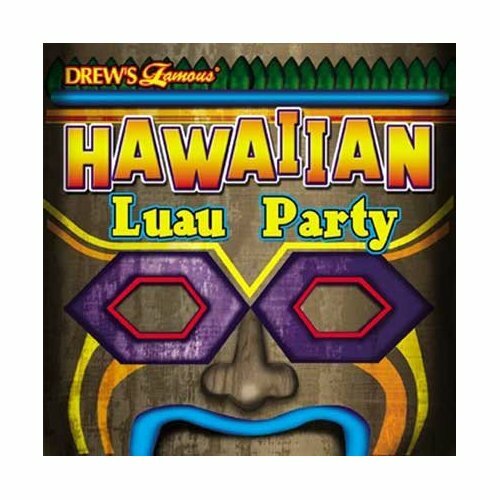 But, I did a little research on my own and starting off very simply with “Hawaiian Luau Party” at the iTunes store. Two albums popped up. Hawaiian Luau Party by The Hit Crew came very highly rated. 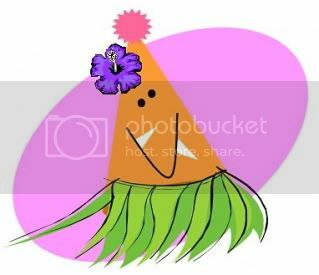 Upon listening to a sampling, it definitely gets your grass skirt shaking. But, with selections like Day-O, Rock Lobster and Cha Cha Slide, it does not have the authentic sound I was hoping for. 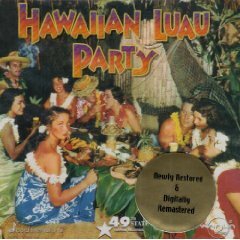 Hawaiian Luau Party by various artists is just what I was looking for. Although I am questioning my tolerance for the ukele, I would say it offers a more credible luau sound with hits like Sweet Leilani, Hukilau (of course!) and Hawaiian War Chant (which is certainly not as scary as it sounds). I was reading a review of it on Amazon which included “surprisingly taken up in the fascinating weird world of this amazing CD” – enough said, we have a winner!